The Hips are a powerful set of muscles. Make sure you can use them! Whether you are a general fitness fanatic, endurance based athlete, team sport athlete, crossfitter, or weight lifter, the hips are one of the key areas you need to have an adequate amount of mobility, flexibility, stability, and strength. Problems arise when one or more of those components are missing. What problems would those be? The most commons issues we see at Precision Fitness are hip pain, knee pain, and lower back pain. 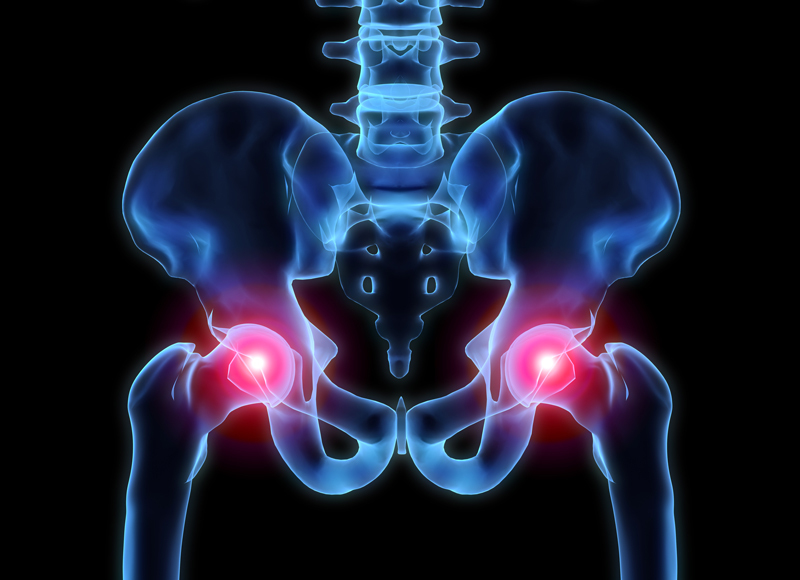 The hip joint is designed to have a lot of mobility. When hip mobility is reduced or non existent, other joints will try to make up the difference and assist the hip with the movement. Golfers and baseball players for example need a lot of hip mobility to be able to swing the clubs and the bat. If the hip is immobile, the lower back will compensate and help generate the added mobility to get the body to turn. This leads to lower back pain at some point. The hip is also designed to help stabilize the knee as well through the glute medius and glute minimus. We tend to find that many of our clients are weak in these two muscle groups. Weak glute medius and minimus results in an internal rotation of the knee while squatting, running, etc. The internal rotation of the knee increases the likelihood of knee issues at some point down the road. Strength is also an issue as well. If your glute max is weak, that means other muscle groups will have to pick up the slack. In this case the hamstrings will have to do that. If the hamstrings get overloaded due to weak glutes, and overuse injury will occur at some point. Let’s not forget about flexibility. There are a lot of muscle that are associated with the hips. The glutes are usually the ones most identified with the hips, but there are also the quads, hip flexors, adductors, abductors, hamstrings, and hip rotators. A lot of stuff to worry about. Any tightness in one group can affect the function of another. For example, tight hip flexors/quads will lengthen and inhibit the glutes, shutting them down and causing them to become inactive. We see this a lot in folks who sit at a desk all day, travel for work, or are doing repetitive hip flexion over and over again (cyclist). The exercises described in the above video, can be used as a warm-up, if you have healthy hips. However, if you have hip issues (tight, weak, and immobile hips) you should perform multiple sets of each of the exercises. Send me the Beginner Hip Protocol E-Book!